PLEASE NOTE THAT I AM SLOWLY TRANSFERRING THIS BLOG TO ITS NEW HOME AT www.batsav.com. For a general introduction to the Bats people, their history, culture, and language, please click here. I have also reproduced (in full) a lengthy article on the Bats written by Prof. Roland Topchishvili from the University of Tbilisi, which can be read here. For photographs - old and new - this page would be an excellent place to start. There are many other photographs on this website: More historic images, and some recent photographs taken in Tsovata, others taken by my friend Pridoni Beroshvili. To see a composite, annotated satellite image of the Tsovatatistsqali Valley, the ancestral homeland of the Bats people, please click here. To read about a festival called "Zezwaoba-Dalaoba", which involves a dramatic horse race, please visit this page, and for more information on Bats/Vainakh/Caucasian horses and horsemanship, please click here. I have also translated a very interesting chapter about the traditional "doghi" funerary horse races, i.e. a horse race like that held to mark the anniversary of the death of Zezwa Prindauli (see Zezwaoba), which you can read here. More information on animal symbolism in funeral ceremonies and monuments can be found on these two pages - one is dedicated to a pair of horse-shaped tombstones still standing in situ south-west of Tbilisi in Georgia, and the other to a pair of eastern Anatolian ram-shaped tombstones held by the archaeological museum in Diyarbakir. Robert Chenciner (of Eastern Caucasological fame) kindly asked me to publish his notes on the feast of Wastyrdjy, or the Feast of St. George as celebrated in North Ossetia. His blow-by-blow (or, rather, toast-by-toast!) account of the feasting and religious rituals makes for a fascinating read! Mr Chenciner has also sent me a digital copy of a book on the Andi people of Daghestan, published in Makhachkala in 2002. I plan to slowly edit and publish several extracts from this book here on my blog. The first installment is a copy of the Adat (laws) of the Andi, as well as a text concerned with the levying of tribute by the Andi upon a neighbouring village. 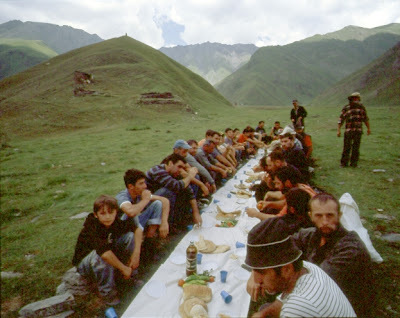 I have also published a short post and links to various works of Prof. Shorena Kurtsikidze and Prof. Vakhtang Chikovani, who are both experts in the ethnography of the Caucasus - particularly of Khevsuerti-Pshavi and the surrounding area. 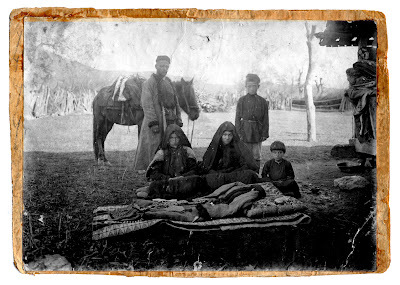 There is an amazing series of photographs taken by Prof. Chikovani on the website of the Phoebe Hearst Museum of Anthropology at the University of California, Berkeley, and a very interesting pdf article written by both profs on the ethnography of the Pankisi Gorge in northern Georgia. For information on Caucasian rugs and kilims, please read this post. For information on how to travel to Georgia without flying(! ), please click here. I also have a small post on the abandoned railway project which was to link Georgia and Chechnya. 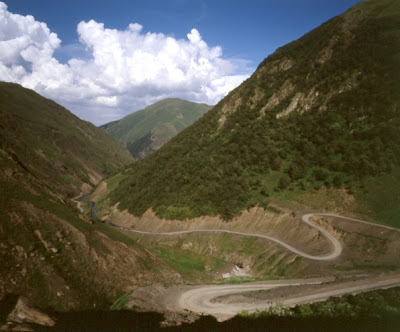 It seems that quite a few people end up on this blog when searching for ways of travelling between Turkey and Georgia, so I have written down a few recommendations on how to go from Trabzon to Batumi and Tbilisi. 5. A list of Vainakh divinities. I have also just compiled a small bibliography of works relating to the Caucasus, which can be found here. The Deutsches Museum in Munich has a scale model (1:10) of an Ossetian brewery, built according to descriptions of the famous traveller and caucasologist Adolf Dirr, which I have copied here. Et specialement pour vous les Francais, j'ai mis en ligne la traduction francaise du "stumar-maspindzeli" ("L'Hote et l'Invite") et du "gvelis tchamieli" ("Le Mangeur de serpent") de Vazha Pshavela, traduit par Gaston Bouatchidze. For Google Earth fans, I have uploaded downloadable ".kmz" files to my blog showing all the villages of Khevi (a.k.a Kazbegi), Pshavi, and Khevsureti (including Arkhoti), as well as a highly-detailed Soviet military map of Pshavi. I have also copied and compiled some very interesting demographic figures on the population of Khevsureti which I found in Sergi Makalatia's Khevsureti (Komunistis Stamba, Tbilisi: 1935). I uploaded a song in Bats/Tsova-Tush to YouTube which I filmed in Zemo Alvani. Kevin Tuite from the University of Montreal let me copy his interview with Pilipe Baghiauri - tav-khevisberi (chief priest) of the Pshav commune of Gogolaurta in Georgia. Dr. Mamardashvili from the National Museum in Tbilisi kindly gave me (low-resolution, alas!) copies of the Museum's ethnographic maps of Tusheti, Qvara-Tianeti, and Piraketa- and Pirikita-Khevsureti. Prof. George Hewitt from SOAS let me reproduce his article entitled The Russian Academy and the Caucasus in the XVIIIth Century, which contains some very interesting information on the first academics to study the Caucasus and its peoples in detail. 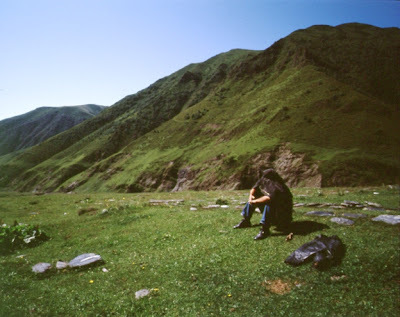 Prof. Tuite also passed on to me a catalogue of the collection of Mirian Khutsishvili's ethnographic films, which he filmed all over Georgia. The catalogue comprises Prof. Tuite's descriptions of all the films. Mirian Khutsishvili - who started filming in the 1950s - still works for the Georgian National Museum in Tbilisi, and is a remarkable man! I have also copied the sections relevant to the Caucasus of the UNESCO's Atlas of the World's Languages in Danger. I also created a post entitled "Through Foreign Eyes - The Bats/Tsova and the Tush in Ethnographical Literature", where I copy all the references to them I have come across in the many books I have read. Please bear in mind that you can return to this Index page (and indeed to any other particular entry) by using the "menu" on the right-hand side! And feel free to contact me at --alexjtb--at--gmail--dot--com--! Any comments or suggestions would be VERY MUCH APPRECIATED! If you leave comments on this blog without logging into Blogger, please make sure to include your email address, as I will not be able to reply if it is hidden. Thanks to "Google Translate", the entire blog (or individual posts) can be translated! Pour voir ce site en Francais, cliquez ici! Um diesen Blog auf Deutsch zu sehen, bitte klicken Sie hier!